The African Journal of Marine Science, Volume 38 2016, presents a supplement on the KwaZulu-Natal Bight. The KwaZulu-Natal Bight is an offset in an otherwise 1 300 km curvilinear coastline on the east coast of South Africa. This offset, and associated expansion in shelf width, was caused by a change in the tectonic origin of the continental shelf margin, from a sheared to a short-rifted section, and is approximately 160 km long between Durban and Richards Bay. The introductory paper of this supplement lays the basis for this special issue by briefly presenting the state of knowledge on the KwaZulu-Natal Bight at the start of a ship-based research project that ran from 2009 to 2013. The bight project has generated numerous new research papers, 14 of which are presented in this special issue, and which cover the topics of physical oceanography, sediments, benthos, bacteria, microphytoplankton, zooplankton, demersal fauna, food webs and trophic structure, and ecosystem modelling. The project was a major component of the South African Department of Science and Technology’s African Coelacanth Ecosystem Programme which has been prominent in supporting research on the east coast of South Africa and the wider south-west Indian Ocean. A synthesis of the generated findings is presented in the final paper of this special issue to formulate an updated view and understanding of ecosystem functions in the Bight. The list of papers below has been made available for a limited free access period (until end September 2016). The articles can be accessed by clicking on their respective titles below. A brief overview of the ACEP project: Ecosystem Processes in the KwaZulu-Natal Bight. ST Fennessy, MJ Roberts and AW Paterson. Circulation of shelf waters in the KwaZulu-Natal Bight, South Africa. MJ Roberts, C Nieuwenhuys and L Guastella. Unconsolidated sediment distribution patterns in the KwaZulu-Natal Bight, South Africa: the role of wave ravinement in separating relict versus passive sediment populations. A Green and CF MacKay. A system-level modelling perspective of the KwaZulu-Natal Bight ecosystem, eastern South Africa. UM Scharler, RC van Ballegooyen and MJ Ayers. 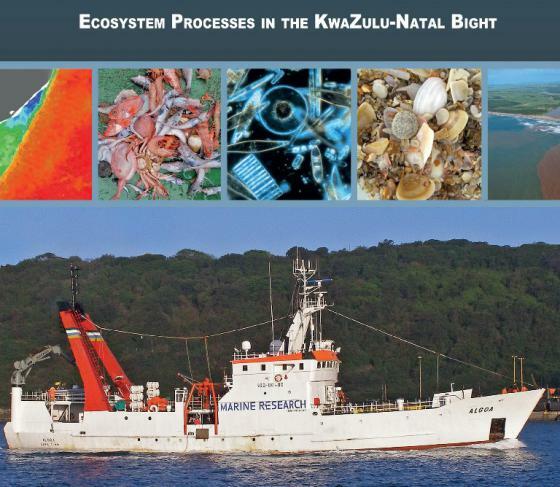 An editorial synthesis of the ACEP project: Ecosystem Processes in the KwaZulu-Natal Bight. ST Fennessy, MJ Roberts and RG Barlow.